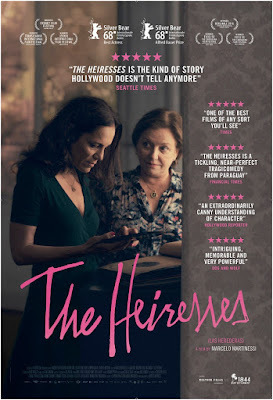 Distrib Films US announces the much-anticipated U.S. theatrical release of Marcelo Martinessi’s acclaimed debut feature "The Heiresses" (Las herederas), Paraguay’s official submission in the foreign-language film category for the 91st Academy Awards®. Winner of numerous international film awards, including two Silver Bears at the 2018 Berlin Film Festival, "The Heiresses" opens on January 16, 2019 at Film Forum in New York City, followed by other U.S. cities. A fascinating and subtle commentary on Paraguayan society, "The Heiresses" follows the stories of Chela and Chiquita, both of whom descended from wealthy families in Asunción, and have been together for over 30 years. Recently their financial situation has worsened and they begin selling off their inherited possessions, but when their debts lead to Chiquita being imprisoned on fraud charges, Chela is forced to face a new reality. As Chela settles into her new life, she encounters the much younger Angy, forging a fresh and invigorating new connection. Chela finally begins to break out of her shell and engage with the world, embarking on her own personal, intimate revolution. Featuring outstanding performances (Ana Brun as Chela won the Best Actress prize in Berlin), "The Heiresses" puts Paraguay on the international cinematic map and announces Martinessi as an exciting talent to watch.